More than 1,000 volunteers rushed to fill sandbags early Wednesday as many in North Dakota tried to protect themselves from historic floods that are expected to swamp the area. At 3:30 a.m., hundreds of volunteers were packed into individual sandbagging centers, an organizer said. “There have been so many volunteers that we had to turn people away,” said Ryan McEwan, a supervisor at one volunteer coordinating center. “It is very busy. They are filling sandbags as fast as they can.” Fargo city officials estimated that as many as 10,000 volunteers have come forward since Sunday to aid in a sandbagging effort that has taken over North Dakota State University’s central arena, the Fargodome, and to help build levees along the now closely watched Red River. See a map of the affected area » That river posed the greatest risk of about eight rivers in the state that were at flood levels, emergency officials said. The fear is that the Red River could overtake all previous records. As of Wednesday morning, the Red River ran at about 33 feet — 15 feet above flood stage. A record level of 41.1 feet was set in April 1997. That level could be surpassed Friday, Cecily Fong of the North Dakota Department of Emergency Services said Tuesday. More than 1,000 people were evacuated from an area near Bismarck on Tuesday night as the Missouri River flooded, Rick Robinson of the North Dakota Department of Emergency Services said Wednesday. Recent rain and blizzard conditions have swollen the rivers. Gov. John Hoeven received word late Tuesday that North Dakota had received a presidential disaster declaration. “We’ve had a severe winter and are experiencing significant flooding across the state, so we are grateful to receive this federal assistance as we continue the flood fight and recovery effort,” Hoeven said. Under the declaration, the federal government will cover 75 percent of the costs. “We’re concerned about the rise of the river and how fast it’s coming up, so our concern is that we’re going to hit 41 feet,” Fargo Deputy Mayor Tim Mahoney said Tuesday, adding that the way the levees are set up, they would protect against overflow up to 38 feet. Officials are guessing the Red River, which runs through the eastern parts of North and South Dakota, and western Minnesota, could crest in Fargo — North Dakota’s largest city, with about 99,200 residents — anytime Friday or Saturday and that the water may linger at its crest height. The city has canceled all trials scheduled in Fargo Municipal Court through April 2 because of the expected flooding to allow police officers to be available for possible emergencies, according to the city’s Web site. 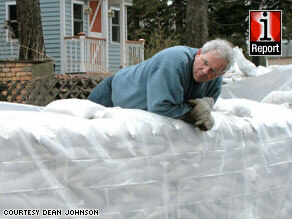 As of late Tuesday, Fargo residents and out-of-town volunteers had filled more than 1 million sandbags out of the needed 2 million. Mahoney said he hoped that, with the 24-hour sandbagging effort at the Fargodome, that goal will be met by Thursday. Another factor threatening efforts is the possibility of freezing temperatures, because sandbags freeze together and then aren’t individually stackable.